*This post is sponsored by Honey Bunches of Oats Greek Honey Crunch. I received free cereal in exchange for this post. All opinions are my own. Have you ever had a little debate with yourself in the morning, trying to decide if you want yogurt or cereal for breakfast? Well, now you can have both with Honey Bunches of Oats Greek Honey Crunch! With the one-of-a-kind unmistakable crunch of the traditional Post® Honey Bunches of Oats cereals, new Honey Bunches of Oats Greek Honey Crunch also mixes in the perfect combination of crispy whole grain flakes and two tasty, crunchy granola clusters made with real Greek yogurt. This cereal has the perfect crunch with just the right amount of sweetness. This is everything you love about Honey Bunches of Oats with the added bonus of delicious yogurt clusters, which you’ll soon be searching for like a child with marshmallow cereal. You may even find yourself picking the yogurt bits straight out of the box! 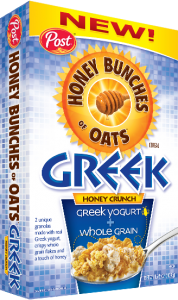 Honey Bunches of Oats Greek Honey Crunch has 33 grams of whole grain per serving and 5 grams of protein. Even your kids will love this heart-healthy cereal! Toss some Honey Bunches of Oats Greek Honey Crunch in a bag with nuts, raisins, and dried fruit and enjoy some tasty trail mix! It may seem redundant, but this cereal tastes great on top of yogurt! Throw a handful on top of your plain or vanilla yogurt for a great crunch with a touch of sweetness. It’s great as an after-school/afternoon snack! Who says cereal is just for the morning?! 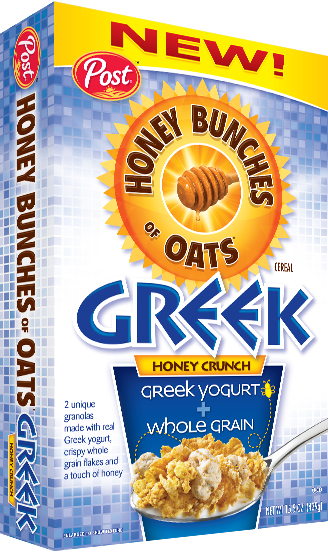 Head to your local grocery store and pick up a box of Honey Bunches of Oats Greek Honey Crunch today! Or, if you are lucky, you will be the lucky Chasing Supermom reader who will win 2 boxes of this tasty cereal! Good luck! I really love yogurt but i think cereal is # 1!! Cereal! Easier to eat anywhere and less of a mess with the kids! I only ever eat the two together 😉 cereal with yogurt is my favourite breakfast! Depends – I like cereal for breakfast and yogurt for lunch. Yogurt isn’t bad. I just tastes that way. I prefer cereal lol. I love greek yogurt but cereal is my first choice. I can eat it for breakfast, snack, or dinner!! I like cereal more but I try to eat yogurt because it’s good for you! yogurt but my boyfriend loves cereal. Cereal which I eat just about everyday. I prefer yogurt over cereal. i love them both so i would just switch off..thanks for this opportunity…. I like both but I prefer cereal.